Through Community Integration, people participate in a variety of activities and experiences based on monthly activity schedules and personal interests. The Arc partners with a variety of community organizations and entities to further enhance individual daily experiences in the community. Community Integration Services are provided under Day or Supported Retirement Programs. People with disabilities who are not of typical retirement age or choose not to work can receive services through The Arc’s Day Program. People are supported to participate in a variety of community experiences and learning opportunities. Services include support to explore, discover, and participate in integrated community experiences such as learning, recreation, personal enrichment and development, and volunteer opportunities. People with disabilities that are over the age of 50 are able to participate in The Arc’s Supported Retirement Program. 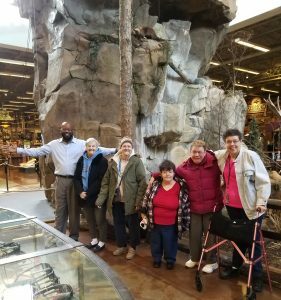 In addition to the monthly activity schedule, people are supported to attend activities at local senior centers and community activities targeted toward seniors.